ABB has been pioneering the voltage source converter (VSC) for high-voltage direct current (HVDC) applications since the first installation of HVDC Light. After more than 20 projects commissioned and the uptake of commercial operation, it is now time to take the next step in power transmission capabilities, using HVDC Light with improved current capacity, compactness and controllability. ABB’s predecessor company, ASEA, started work on HVDC transmission in 1929 with the development of the Classic HVDC product, also known as the line-commutated converter (LCC). In 1954, ASEA constructed the world’s first commercial HVDC link – to the island of Gotland, in the Baltic Sea. This pioneering heritage was later expanded to VSCs and, in 1997, ABB laid the ground for the world’s first VSC-HVDC demonstration project, in Hällsjön, Sweden, thus introducing HVDC Light. This groundbreaking event marked the advent of transistors as power semiconductors for HVDC transmission, which allows voltage and frequency to be controlled by the converter. Since the introduction of HVDC Light, well over 20 projects have been completed or are under construction. HVDC Light technology is being successfully deployed in an increasing number of applications, thanks to the parallel development of higher converter voltage and power ratings, improved semiconductors based on insulated-gate bipolar transistors (IGBTs) and advances in extruded cables with solid-polymer insulation →1. By embedding HVDC Light functionalities into an AC network, voltage support, reactive power compensation, black start and the performance of existing grid assets can be reinforced. HVDC Light converter valve in a power-from-shore application. The evolution of HVDC Light started in the mid-1990s with the idea being to bring the excellent dynamic performance of VSC that had existed in train drive systems and variable-speed drives over to transmission systems. At this time, vital supporting technologies – such as high-voltage semiconductors and digital control systems – were also rapidly evolving. HVDC Light was launched in 1997 with the Hällsjön pilot after three years of intense research and development dedicated to solving, for example, the problem of how IGBTs could be controlled in series connection, thus enabling a high-voltage IGBT setup that could operate in the kHz range. 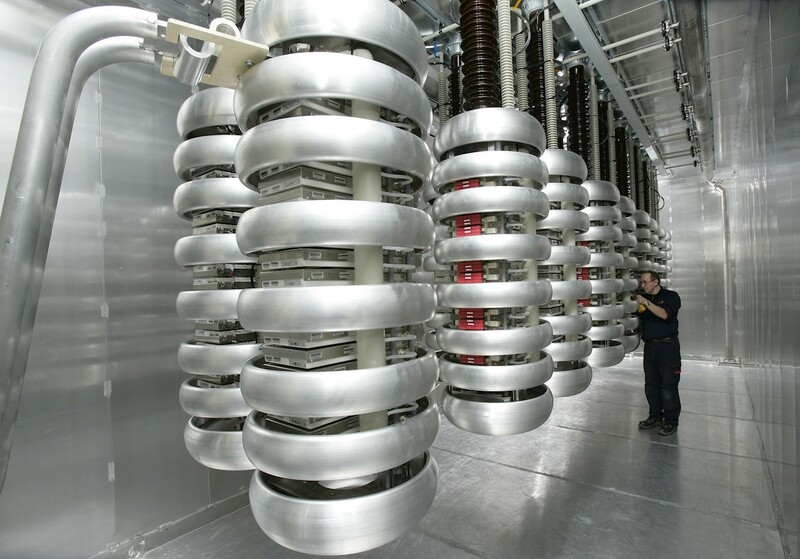 Technology areas such as system design, valve design, control and protection design and plant design were adopted for the voltage source technology from ABB’s knowledge of classic HVDC in order to create HVDC Light. The first commercial HVDC Light link, on Gotland, was to support the integration of renewable wind power into a fairly weak island grid. The project was a showcase for how HVDC Light can support grid resilience through active and reactive power control with high dynamic performance. The power level was a modest 55 MW at 80 kV. The next evolutionary step was to introduce HVDC Light as an interconnector between asynchronous grids. Since HVDC Light can easily adapt to required grid codes without any negative effect on existing grid infrastructure, fast delivery time and additional auxiliary services such as black start and AC voltage support are possible. Interconnector projects were installed in Australia, North America and Europe. HVDC Light has always targeted environmental challenges, resulting in the development of power-from-shore applications for the oil and gas industry as well as for the connection of remote offshore wind generation →2. For the latter, HVDC Light enables connection distances above 100 km – a difficult proposition for conventional AC solutions. In fact, voltage- source HVDC has been a fundamental enabler for remote offshore wind farms. Further, projects in Norway have proven HVDC Light’s ability to provide a solution with small physical footprint and weight, and with a performance and availability superior to gas turbine technology. HVDC Light was originally always combined with high-voltage, extruded XLPE DC cables, which give a high power density with a narrow right of way. Solutions with a mix of overhead lines and cables or only overhead lines have also been deployed. In the Caprivi Link project between Namibia and Zambia, for example, two weak grids are connected by a long HVDC Light overhead line. The Caprivi Link can be expanded from an asymmetrical monopole to a bipole scheme in a later stage – which is possible thanks to HVDC Light’s controllability, where control parameter adjustment enables easy adaption to different grid conditions.